So you’ve discovered the wonders of hiking with your dog? Good for you! I’ve been hiking with my dogs for over 10 years so I can attest to how awesome it is. I can also attest to how overwhelming it can be as a beginner hiker. There is so much to know and learn. Here are my tips to get you started on on the right paw. There is no shame in being new to hiking. However, it may feel intimidating to ask newbie questions in a group or forum of seasoned hikers. I’ll address some of the more basic points so you don’t have to ask. There is nothing worse than getting excited about a hike, driving all of the way there, and finding a “no dogs allowed” sign. 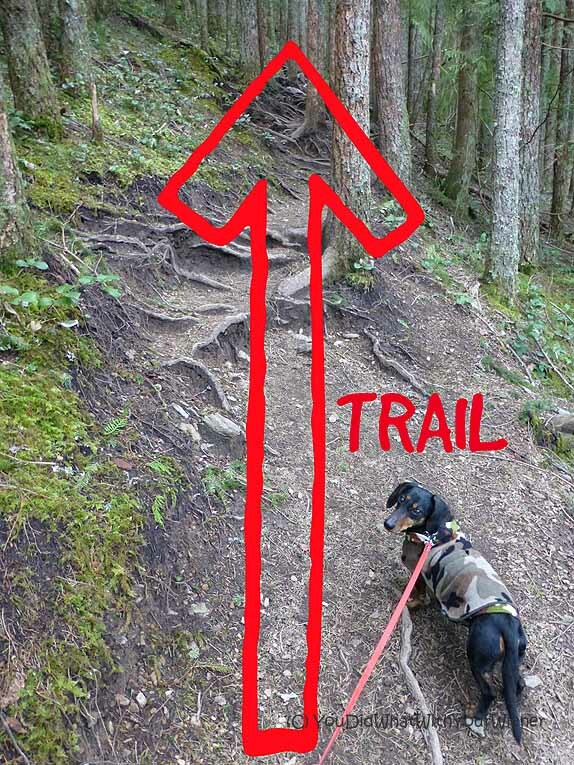 Before you start trip planning, make sure you check the rules and regulations to see if dogs are even allowed on the trail. Here are the general rules for differing state lands. National Parks (Federal jurisdiction) – While there are a (very) few dog friendly US National Parks, dogs are not allowed on trails as a general rule. (However, the are allowed in many Canadian National Parks). Forest Service land (Federal jurisdiction) – Dogs are allowed on all Forest Service lands in all States (at least I am not aware of any and I have traveled to many states). 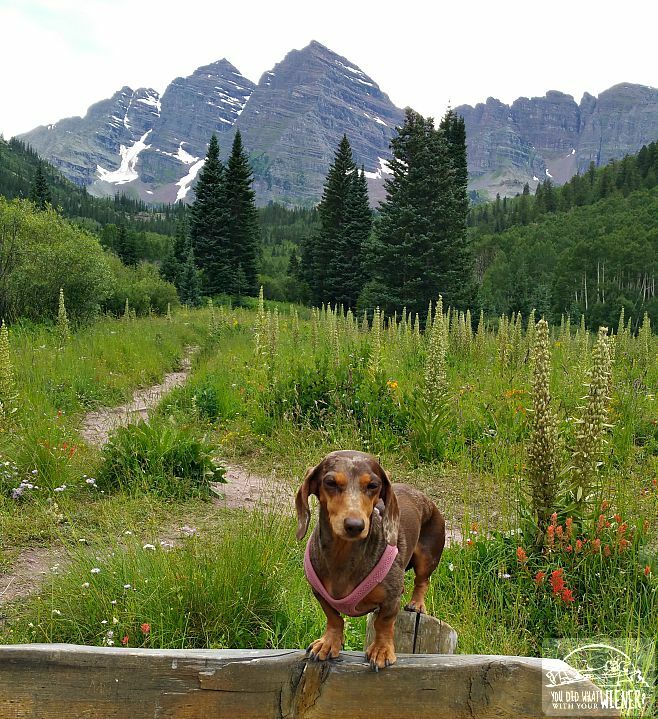 Since dogs aren’t allowed to hike in most National Parks, and most National Parks are surrounded by Forest Service lands, finding trails adjacent to National Parks is a great way to experience the area with your dog. Department of Natural Resources (DNR) and Bureau of Land Management (BLM) land (State jurisdiction) – Dogs are allowed on almost all of these land types. State Parks (State jurisdiction) – The rules regarding dogs can vary from state to state when it comes to State Parks. For example, dogs are allowed on trails in almost all State Parks in Washington but there are many restrictions regarding dogs in California State Parks. It’s best to do thorough research, or call and ask, before you go. Note: most of these land types will require some kind of parking pass and/or entry fee and, unless you purposely buy a combined pass (if available), you will need to make sure you know what agency manages the land you are hiking on to know which pass to purchase and display. Before you decide to hike a particular trail, you’ll want to gauge how hard it is first. The main factor in determining this is knowing how long it is and how steep it is. Most trail websites and descriptions will list the mileage. But is that mileage one-way or round trip? Make sure to read the fine print so you know. Obviously, if the website only lists one-way distance, you will need to double that to get the total hiking distance. You’ll then want to look at the elevation GAIN and divide that number by the ONE WAY mileage of the trail. That will tell you, roughly, how many feet per mile you will ascend while hiking. Anything under 200 ft/mile is pretty easy. Anything over 500 ft/mile is pretty tough. In between that, it may or not be a challenge depending on your fitness level. The elevation gained per mile DOES NOT tell the whole story. That figure is the gain from your starting point to your ending point. it doesn’t necessarily tell you what’s happening in between. Be sure to read the trail description and/or reports from other hikers. Trails are not necessarily straight up so, although your elevation gain/mile calculation gives you a rough idea, it doesn’t tell the whole story. More often than not, the trails are a series of ups and downs. You may be hiking uphill more feet than your total elevation gain number indicates. Also, and most importantly, some trails start out pretty flat and accomplish all of the elevation gain in one small section. For example, we have a local trail that is listed as 8 miles round trip (so 4 miles one-way). The elevation gain is 1,600 feet. That “works out” to 400 feet of elevation gain per mile. That doesn’t sound too bad. However, if you read the trail description, you will find out that the beginning of the trail is pretty flat and you gain 1,200 of those vertical feet in a mile. Yikes! Everyone hikes at a different speed depending on fitness, how steep the trail is, terrain, and personal preference. The average hiking pace is usually around 2 mph. However, someone new to hiking may walk slower. When calculating expected trip time, it’s always better to over-estimate. I always add 1 hour to the total time I think it will take me. If you are new to hiking, you may want to add 2 hours. Making sure you and your dog are physically fit enough for hiking – If you aren’t, you could risk having a miserable time and/or getting injured. 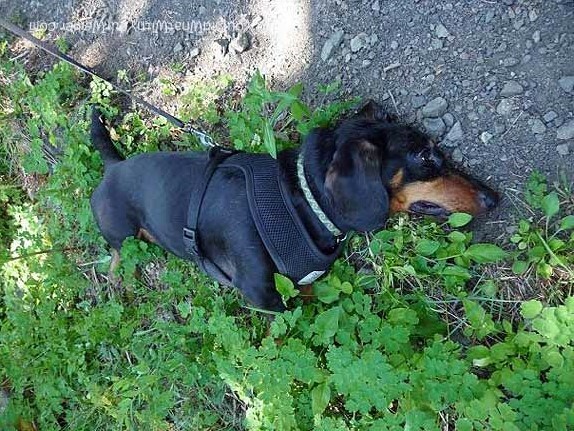 To prepare for hiking season, make sure you and your dog are used to regular walks on varying terrain. You may want to go to the gym to strengthen your legs and core. While you’re getting your dog ready for hiking, you might also want to have them do some conditioning exercises. Wearing the right clothing – For you, the most important piece of clothing is footwear. You can’t get anywhere without healthy feet so get a sturdy, comfortable pair of hiking boots/shoes. I also highly, highly, highly suggest wool or synthetic socks. As for your clothing, avoid cotton, wear layers, and consider bringing a rain jacket. In most cases, your dog doesn’t need anything but a leash and collar or harness (suggested). However, depending on the weather and terrain, they may need a jacket, cooling vest, boots, or paw balm for foot protection. You may also want them to carry a backpack. Bringing the right gear – My theory is that it’s better to bring more than you need instead of less. Check out this article to see what I bring when I go day hiking with my dog. Bringing enough food and water – Bring as much as you think you and your dog will need and then bring a little extra. You may eat more because you are burning a lot of energy and drink more because you are sweating. You also want to have a little reserve in case you get delayed for some reason. Dogs are very likely to follow us to the end of the earth and then some. They’ll push themselves to keep up with us even if they are exhausted or injured. It’s important to check in regularly with your dog to make sure they are comfortable and safe. Make sure you know the signs that your dog has reached their physical limit and is tired. Regularly check feet for abrasions, punctures or things stuck between the pads on their paws. Check them a few times while on the trail to make sure they aren’t getting chafed by their harness. Make sure they (and you) stay hydrated. Expert tip: Give them more water than you think they need. They won’t always drink when they need it so consider flavoring the water with something yummy to entice them to drink. Downhill hikers should yield to uphill hikers – If the trail is not wide enough for two people, or two people and two dogs, to pass easily (it rarely is here in the Northwest), the uphill person should offer to step aside and let the person hiking uphill pass. They may decline because they want to take a break though and let you pass them instead. Just be sure to offer. Hikers should yield to horses – Step off the trail to let horse riders pass. Keep in mind that some horses are spooked by dogs, especially if they bark, which can be unsafe for everyone. It’s never a bad idea to ask the rider how they would like you to let them pass for their horse’s safety. Bikers should yield to hikers BUT... – Technically, this is true. In reality, a biker might not see you until they are right on top of you because they are moving faster. Also, they may be riding up a steep hill and it would be very difficult for them to get off their bike and get started again. Be sure to listen for bikes and be willing to step aside if it seems reasonable. It’s better to be safe than right. Follow the leash laws – If the law in the area is for your dog to be leashed, they should be. Breaking the rules can lead to fines in some areas and other trial users will expect the dogs they encounter will be restrained. At the very least, if you choose to hike with your dog off-leash anyway, leash your dog or hold onto their harness when you see others approaching. Keep your music to yourself – If you choose to listen to music through a speaker instead of headphones, make it just loud enough that you and your party can hear it. Many people hike to escape “artificial” noise and you may get some really annoyed looks (or comments) if you “force” your music on them. A lot of people use hiking trails. In some areas, like Western Washington, trails may see HUNDREDS of dogs and people in one weekend. All of the tiny actions those people make can leave a big impact on the area. In 1994, the Leave No Trace Center For Outdoor Ethics was founded and established a set ethics promoting conservation in the outdoors called Leave No Trace Principles. Using these principles when hiking with dogs means no picking flowers, moving rocks, littering, cutting trail switchbacks (leaving the established trail to take a shortcut), letting your dog dig holes, trampling vegetation, leaving footprints (or paw prints) in soft mud, or leaving your dog’s poop in the woods (that especially includes bagging it and leaving it on the side of the trail). Sure, even with the best of intentions, you can’t prevent all of these things from happening in all situations but be conscious and don’t knowingly do any of these things. These 9 simple tips can take your knowledge level from total beginner to at least advanced beginner, if not intermediate. Knowing these things will also help make the hike more enjoyable, and safer, for both you and your dog. 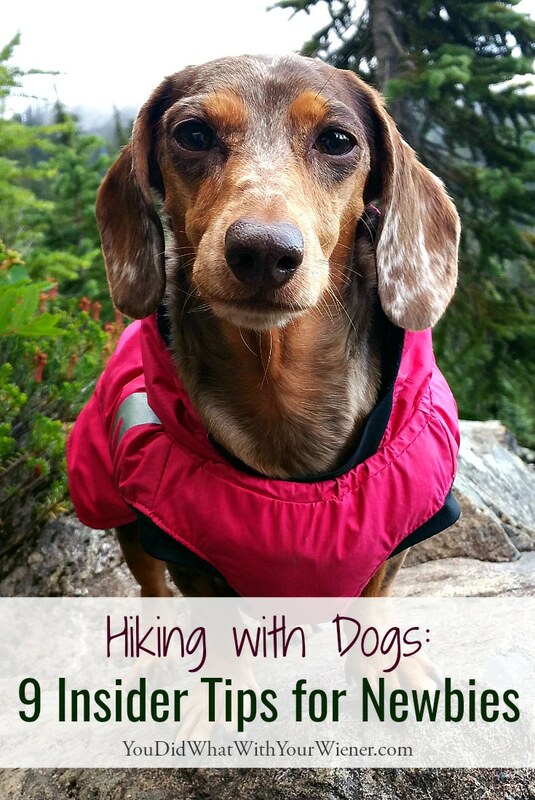 Do you have any questions about hiking with your dog? Leave them in the comment section below. Never knew about the etiquette of downhill hikers giving way to uphill hikers. Feels odd since the downhill hiker might have less ability to stop easily if it’s a steep trail. On a boat, the etiquette when passing under a drawbridge is for vessels against the current to give way to vessels going with the current because going with the current (like walking downhill) gives you less control. Either way, the point you made is to just be considerate to others on the trail and that is always a good reminder. Especially for people hiking with dogs. Yes, it does seem a bit counter-intuitive. I think that’s why people always forget. And it only complicates things when you are coming downhill, stop, and most people going uphill waive you by because they want the break. What kind of foods we needed to carry , if my dog is not favorite of eating pedigree. She likes eating butter and chicken , sometimes milk ,it is cross Pomeranian. Hi Nikkibelle. The food I carry depends on how long we will be out hiking. If it’s just for a day trip, I just bring some dog treats. The treas vary but they are treats made for dogs. If we are going hiking overnight for one night, I sometimes just bring dog kibble. If we are going to be out backpacking several days, I bring dehydrated raw dog food because it’s lighter weight and easier to carry. A couple of my favorites are Small Batch, Stella and Chewys, and Primal. Hope that helps.